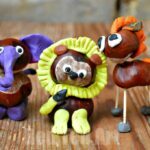 One of my new “favourites sites” is Badut, especially as she is currently doing lovely Chestnuts crafts for kids one after another. Some I remember from my childhood others are quirkily new. The one she “reminded me of”, were today’s Chestnuts Spiderwebs. Last year The Imagination Tree also had a lovely set made with straw and a little naughty (pretend) spider hiding away on it. We also have a FABULOUS Flower God’s Eye Pattern that you really must check out! 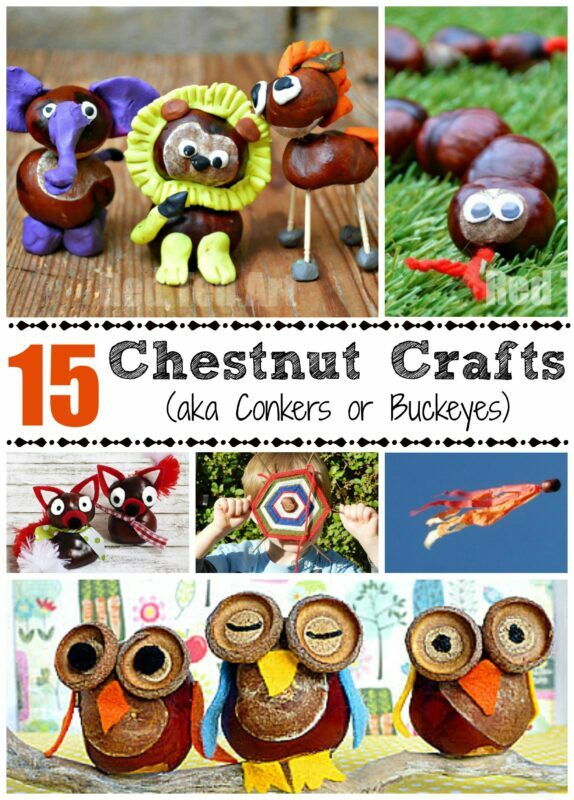 When I saw Badut’s chestnuts crafts this year I remembered that I really wanted to give these a go again with the kids. 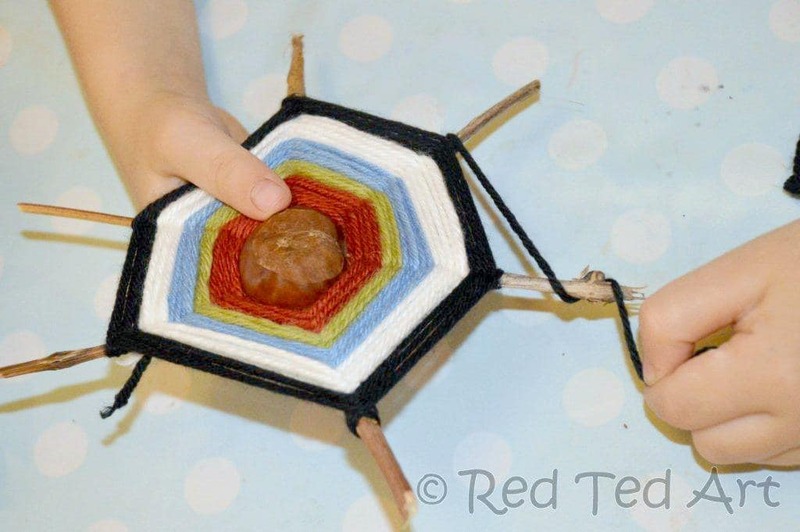 It is a great craft to introduce weaving and “following a set pattern/ action”. As it is relatively easy and you can get into a nice routine. 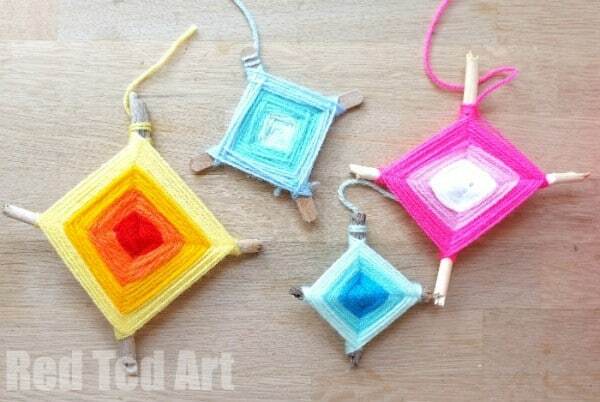 A great craft before trying “ordinary” weaving and things like French Knitting. I think as children we used popscicle sticks and no chestnuts. I can’t remember. But I do remember LOVING making them! Was it the tactile-ness of the wool? Was it the colours? Was it the magical pretty pattern at the end? I don’t know. When I started making these with Red Ted, I was rewarded with lots of “Oh mummy, I LOVE this” and “Mummy, can I take it to show and tell today?” and “Mummy, can we make another one” and “Mummy, I so love all the colours”… Success. Happy Mum. (Red Ted did take it to school, where the teacher asked me to come in and make it with the children. 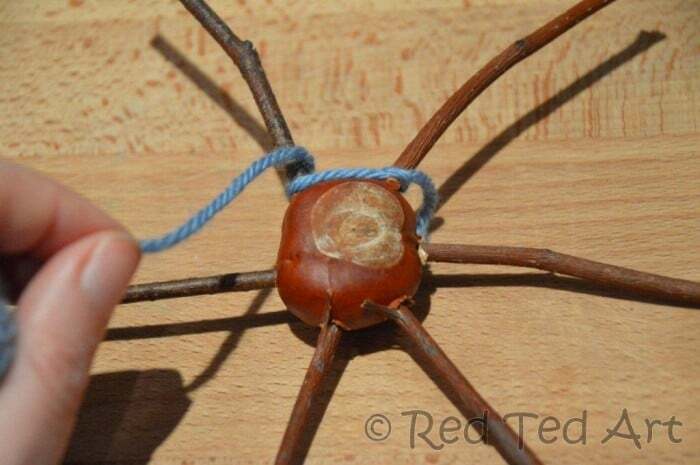 One of his sticks did break with all the children handling it, so if you want a “less fragile” web, do use toothpicks or wooden skewers, which are stronger). 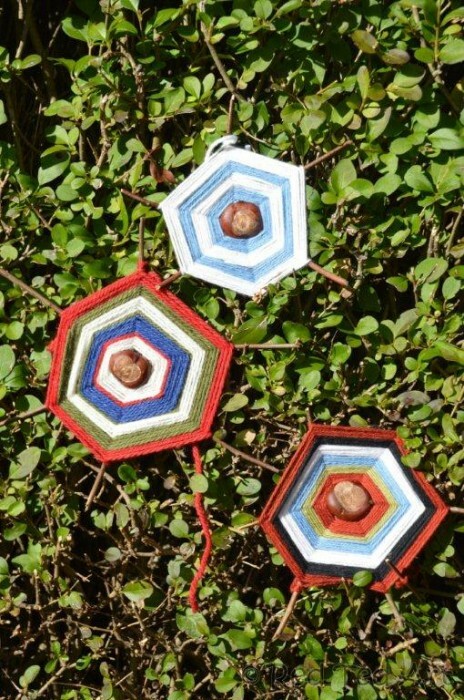 I decided to go for conkers and sticks for our God’s Eye Craft (Badut uses matchsticks and The Imagination Tree toothpicks). 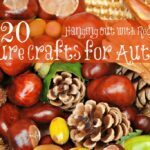 I am always looking for “new” stick crafts, and there are not that many out there (so far we have made Stick Men and used sticks for our Marionettes and our Autumn Mobile). Using sticks, also gives the finished web a natural quirkiness and “spidery” feeling. Watch the video – or check the photos below. 1) Take your chestnut and make 6 holes in it. I found it easiest to make 2 on either side first and then roughly place two in between each of these. 2) Take 6 thin but sturdy twigs approx 10cm long and glue them in (you don’t have to glue them in really, but it does secure it all a little more and avoids potential tears/ frustration later). Let dry. 3) Tie on a piece of wool to the first stick. 4) Then wrap it around the next stickand the next etc. It doesn’t matter whether you go from left to right or right to left. Always wrap in the same direction over each stick, ie over and under or under and over. 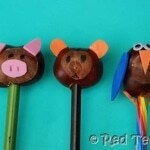 We said “over and round” to get into a little rhythm I held the conker for Red Ted he wrapped. 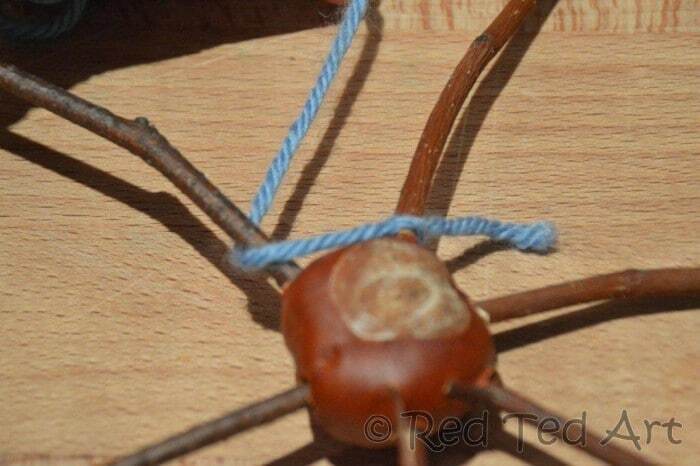 He found it a little tricky to concentrate on holding (and turning) the conker AND wrapping at the same time. It was nice to work together. We made 3 together and by the third he could almost do it himself (depending on whether he lost concentration or not). The boys next door (8yrs and almost 10yrs) had a go too, love it and made them all by themselves! I also let Pip Squeak (almost 3yrs) have a go. She sat on my lap, held the wool, I held her hand and together we wrapped it round. Chanting “Over and Round”, “Over and Round”. Of course she is still too young, but she loved having a go with me and it was a nice start together. 5) If you want to change colours, just cut your wool and tie the next colour on and keep going. 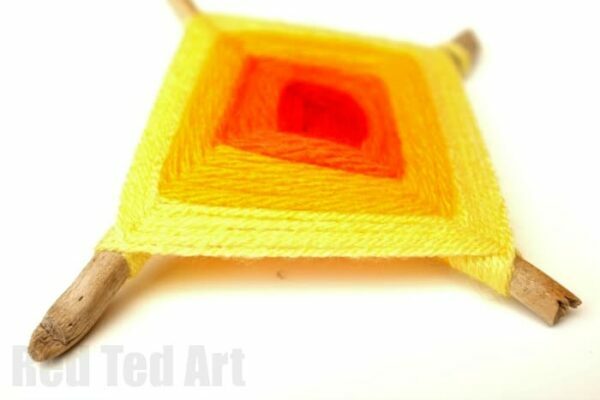 6) When finished, tie your end piece along the last stick, keep a bit of wool enough to hang and you are done! 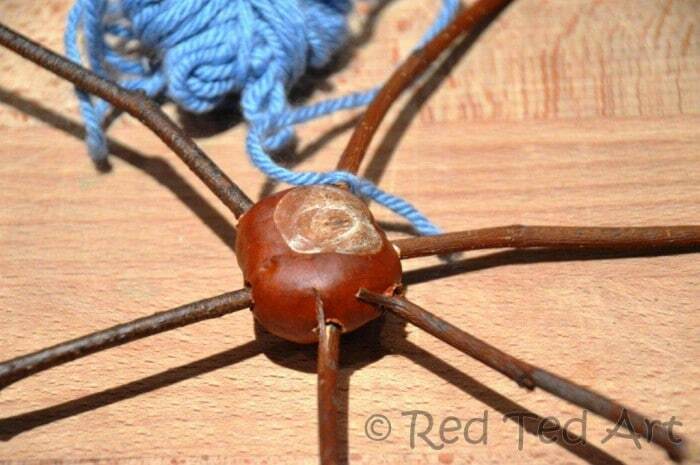 And apparently real spiders don’t like conkers and stay away if you hang these in the window! 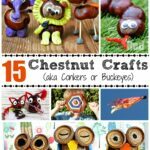 What are your favourite Chestnuts Crafts? Oh what a cool idea to use the chestnut to hold the sticks! Such a shame my kids are allergic to chestnuts! 🙁 Still very cool! These look great. I love the different colours of the wool and going to have a go with J to make some this afternoon. Cerys – thank you and it is a great way to use up bits and pieces of wool! I love this! 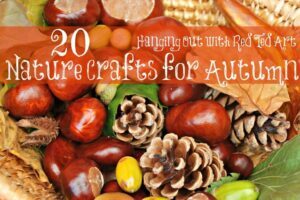 It is so easy and so much fun to do! What a cute idea. I should try this with my preschooler. I think that he would really like it! Love the spider webs, they are beautiful! Thank you 🙂 I can’t wait to give them a go with the kids at school! Brilliant, I love your spider webs! 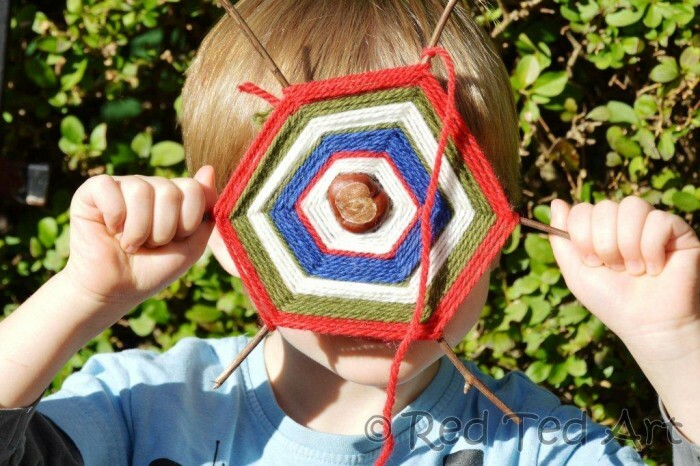 I love the idea of doing this with a conker in the middle! So cool! that’s tomorrow taken care of! We’ve been on a bit of chestnut kick recently, but our conker supply seems to have dried up. 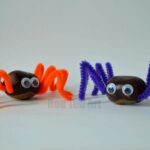 I’m pinning this one and storing it away for next autumn as this is the cutest conker craft I’ve seen! oooh they are fantastic Maggy! Ooooh that’s clever. I have a huge haul of conkers to use! I might try this if I get chance. I love them – but when don’t I love anything you do! I didn’t know that about spiders though! Very interesting. what an interesting idea! I love it. Thank you so much for mentioning my Danish blog Badut. I love Red Ted Art, but most often I don’t really have the time needed to translated my Danish posts and participate in your great link-parties. Badut is what I call a blog of seasons. 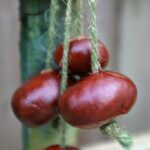 We celebrate all Danish seasons and traditions so the content is varied from Easter crafts and Chestnut fun to Midwinter parties and summer joy. Sometimes we craft, sometimes we cook and at other times the focus is on thoughts and pictures. Your spider webs looks great with the small sticks. 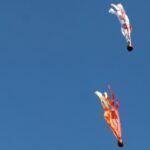 I have tried using them with my kids but find it more difficult so I admirer Red Teds skills. I think my blog translate badly with google translate. I am mostly a writer and my Danish is full of self invented words and quirky sentences. However I do have many foreign readers so maybe it is just me. Yes, I know what you mean! But I am usually interested in the craft and don’t mind too much if google Translate goes crazy on me 🙂 love seeing the crafts regardless! Thank you! 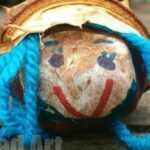 My eldest absolutely adores chestnuts and anything with yarn! 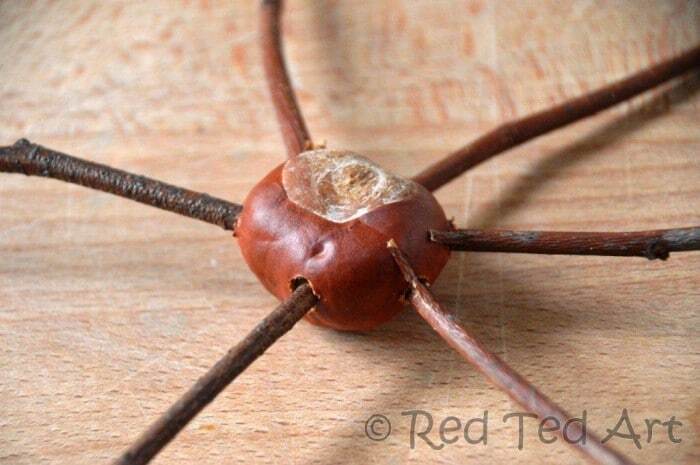 I remember doing these with just sticks and nothing in the middle, but the chestnut “spider” looks good.